View agendas and minutes or listen to audio of past meetings. As of December 12, 2018, new Behavior Analyst Rules are in effect. A new, revised Behavior Analyst application which conforms to the new Rules is now available on the Application Forms page. If the BA application form you are completing does not have the revision date listed on the Application Forms page, you will need to download the new application. Previous versions cannot be accepted. New BA Rules may be downloaded here. The Arizona Board of Psychologist Examiners Office has relocated as of January 2018. 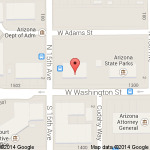 The new address is 1740 W. Adams, Suite 3403, Phoenix, AZ 85007. If you plan to attend a Board or Committee meeting, please allow for extra time to park and screening for security. Parking and front door are on the north side of the building. There is no parking on Adams Street. Visitors may park on the first floor of the parking garage or in the open lot. Arizona does not offer temporary licensure for independent practice. Please see the exemption from licensure statutes at A.R.S. §32-2075. If you wish to practice as an independent psychologist for 20 days or less (160 hours) per year, you may qualify to do so under the exemption statute. A Message about Governor Ducey’s Regulation Rollback Initiative . . .
We’ve made great progress in growing our economy and streamlining state government over the past two years. We still have a lot of work to do to make sure outdated regulations aren’t slowing us down.